Carey Candy Co.'s dreamy confection available in dark or white with the most scrumptious roasted almonds. Suggested uses: Enjoy the whole bag yourself, break into even smaller pieces and place on a platter to share with friends and wine, of course! Carey Candy Co.'s delectable chocolate confection paired with pretzel logs. The perfect combination of sweet chocolate and salty pretzels is bound to give your taste buds a sensation like no other! A favorite of the lumber community of Quincy! OMG! This is so freakin' good! 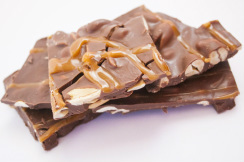 Carey Candy Co.'s smooth milk chocolate confection mixed with crunchy fresh peanuts and just the right amount of caramel, MMMMMMMmmmmmm, get some now, you will not be disappointed! Seriously, get 2, you are not going to want to share!